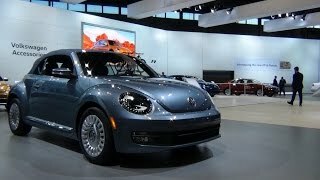 At the 2015 LA Auto Show with the Beetle Dune, Volkswagen introduced the 2000 unit, limited edition model Volkswagen Beetle Denim 2016. Out of the said 2000 models, company will be producing 1000 in Pure White and the remaining 1000 in Stonewashed Blue. So once again we have Volkswagen with another quirky yet attractively designed model. Let us have a look at the review of Volkswagen Beetle Denim 2016 to know about it in detail. The interior of Volkswagen Beetle Denim 2016 keeps its name in its detailing. The first thing that you might notice inside is the jean-like-fabric upholstered seats and the jeans pockets. Moving ahead the same gets the essence of red stitching to gain more eyeballs. Seats look attractive and comfortable while the technology figure is also not sidelined. The model is housed with the all new updated MIB II infotainment system. The system can be utilized through newly integrated 5.0 –inch touchscreen display that now offers better graphics and resolution. The same infotainment system also supports iPod connectivity and a backup camera. The dashboard looks clean with the right side being occupied by glovebox while the left side is dedicated to the three-spoke steering wheel. In all the interior details of Volkswagen Beetle Denim 2016 though are less yet attractive and looks comfortable. 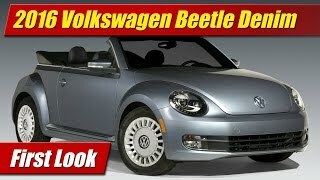 The exterior of Volkswagen Beetle Denim 2016 is very much similar to any Beetle, however to bring the special edition change the major inclusion is the ‘Heritage’ 17-inch wheels and the material that is used to turn and be your roof. It is dark blue and textured in a way that it looks like denim and matches commendably with the interior and exterior color of the model. I must say that today when we are getting ‘limited edition models’ with vibrant colors and lots of features, this model is undoubtedly company’s step ahead to bring the change. 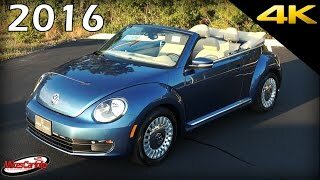 Looking at the exterior details of Volkswagen Beetle Denim 2016 I would say that the work is worth the penny of its buyers. 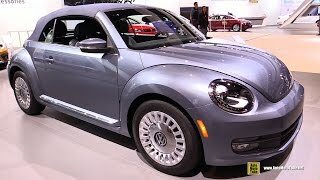 Powering the Volkswagen Beetle Denim 2016 is a 1.8 liter four-cylinder turbocharged engine cranking total output of 170 hp and peak torque of 250 nm paired to six-speed automatic transmission. 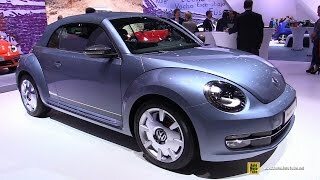 The performance figures of Volkswagen Beetle Denim 2016 are not yet released and I presume that neither is so important, as this is the car you use daily and also a teenager’s choice. However we assure to share the details as soon as the company reveals them.